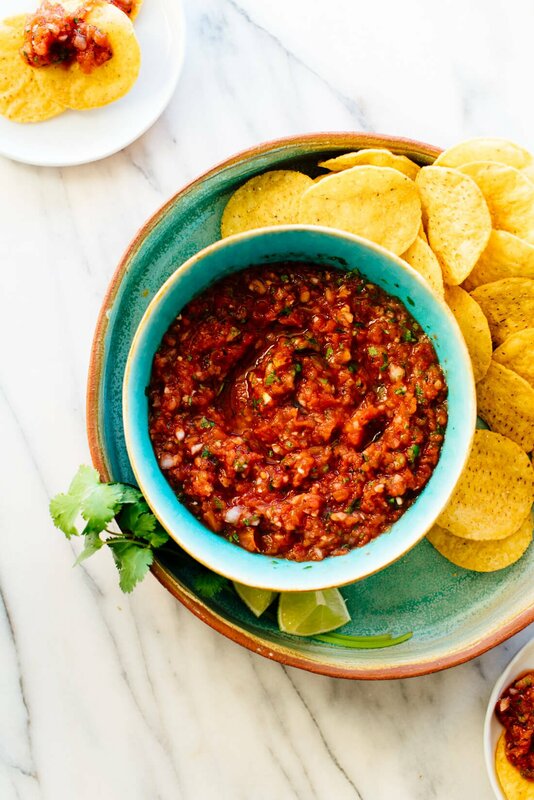 Fellow salsa lovers, this recipe is for you. This red salsa recipe offers fresh, authentic Mexican restaurant flavor. The best part? It’s super easy to make with six basic ingredients. I developed this salsa for my cookbook, since my book wouldn’t have been complete without an amazing homemade salsa recipe. It took me about ten tries to get all the details just right, but man, this recipe was worth it. I served this salsa at my birthday party and watched my friends’ eyes light up when they tasted it. Everyone asked for the recipe, so I’m sharing it on the blog for you today with all of my salsa tips and tricks. Fresh salsa any time the craving strikes? Yes, please. First, buy the right tomatoes. Canned fire-roasted tomatoes offer rich roasted tomato flavor, no cooking required. Since tomatoes are the main ingredient in red salsa, their flavor is key—my favorite brand is Muir Glen. Stock up and you can whip up the best homemade salsa in under 10 minutes. Drain off some of the excess tomato juice in the can. This step ensures that you won’t end up with watery salsa. Blitz the garlic in the food processor. That way, you don’t have to chop it by hand or dirty your garlic press. Roughly chop the onion and jalapeño. Aim for about 1/2″ pieces. This step takes just a minute and ensures that you won’t end up with big hunks of onion or pepper. 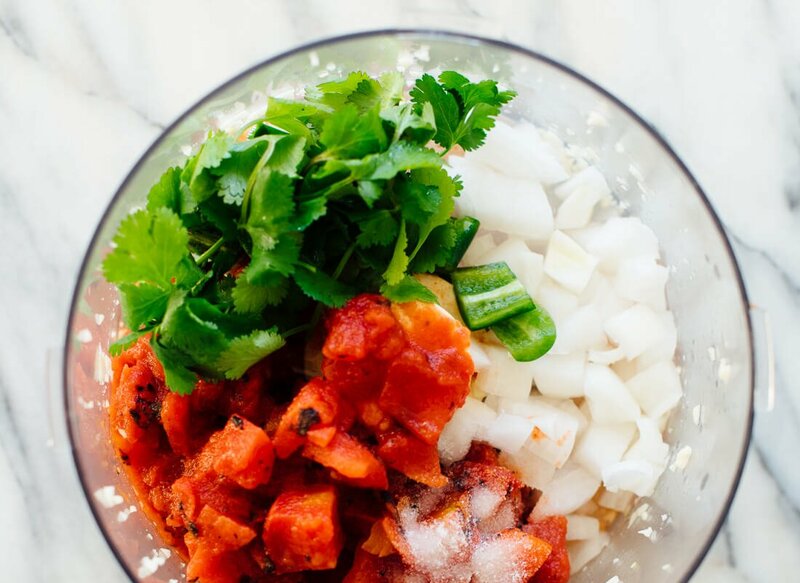 Add the remaining ingredients to the food processor: Canned tomatoes, onion, cilantro, jalapeño, lime juice, and salt. Blend just until you reach your desired consistency. 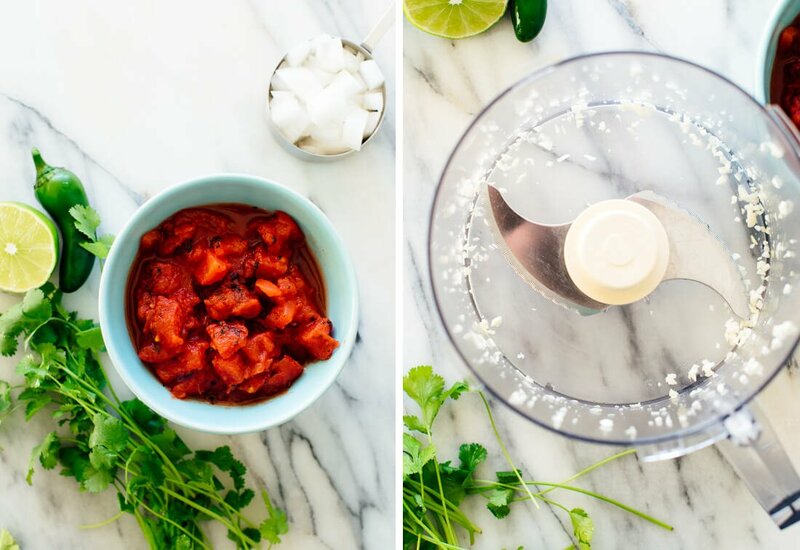 I like my salsa to have some texture to it, so I blend until the ingredients are broken into tiny pieces, but stop before it’s completely smooth. Adjust to taste, if necessary. You might want some more lime juice or salt. I love this salsa because it offers so much flavor, but it’s not excessively salty like store-bought brands. Want to make this salsa more spicy? Add the full jalapeño, ribs and seeds remove. To make it extra-spicy, you can include some of the jalapeño seeds, too. Want to make this recipe for a crowd? The recipe yields 2 cups, but you can easily double or triple it. That’s assuming your food processor is big enough to handle the larger yield. I love my 11-cup Cuisinart food processor, since it handles small and large quantities like a champ (affiliate link). 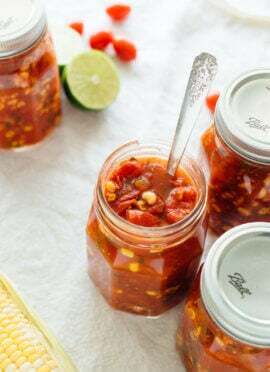 Want to make this salsa with fresh tomatoes? I wish I could say that you could simply substitute raw tomatoes, but it’s not that simple. I have a roasted tomato salsa recipe in my cookbook, which I highly recommend. No food processor? You can make this recipe in a blender, too. Just be careful not to blend the salsa past your preferred consistency. 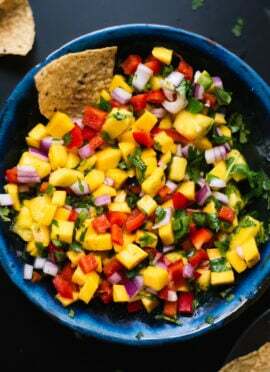 If this recipe sends you on a homemade salsa kick, don’t miss my homemade salsa verde, pico de gallo, fresh mango salsa, strawberry salsa and black bean salad (which can be served as a dip). Please let me know how this recipe turns out for you in the comments! Your feedback means the world to me, and your star ratings encourage other readers to make the recipe. Thank you! 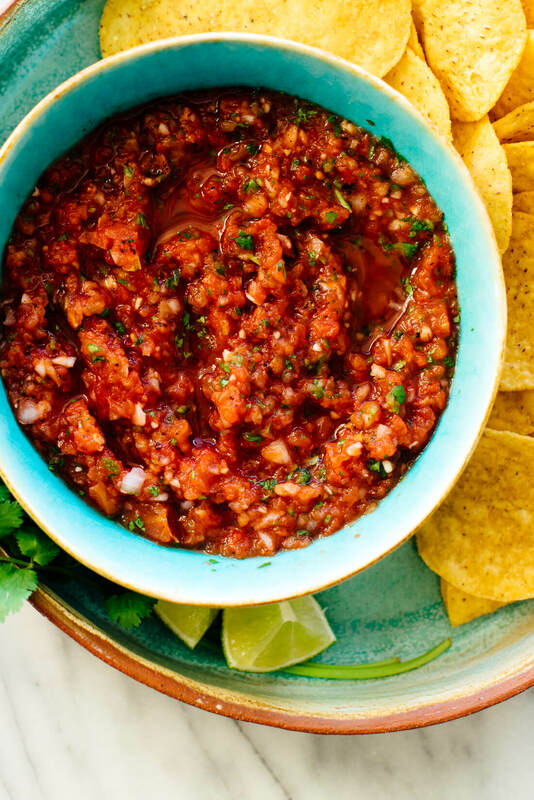 This incredible red salsa recipe offers fresh, authentic Mexican salsa flavor. It’s so easy to make, too—you’ll need only 6 ingredients and 10 minutes. Recipe yields 2 cups; double or tripe the recipe for a crowd. Drain off about half of the tomato juice from the can (about ⅓ cup) and discard it. In a food processor, pulse the garlic to chop it more finely. Add the tomatoes and all of the remaining juice from the can. Add the onion, cilantro, jalapeño, lime juice, and salt. Process the mixture until it is mostly smooth and no big chunks of tomato or onion remain, scraping down the sides as necessary. Season to taste with additional lime juice and salt, if necessary. Serve the salsa immediately or store it for later. This salsa keeps well in the refrigerator, covered, for about 10 days. *Tomato notes: I strongly prefer Muir Glen brand fire-roasted tomatoes. They’re organic, come in BPA-free cans, and offer the best flavor I’ve found in canned tomatoes. You can use regular diced tomatoes, but your salsa won’t have the same depth of flavor. Can I can this salsa? This recipe has not been validated for canning safety, so I do not recommend canning this salsa. I recommend this recipe instead. Sure! Thank you, for the review. 1/2 fresh diced, more pice de gallo consistency, added last—then 1/2 canned for the depth you like, good sub is pickled jalapeno….you rock..!! Thank you for your recipes! Love the veggie black bean enchiladas with homemade sause. Owned 4 schiperkees, great dogs! All became TDI therapy dogs. Did much agility. Glad Cookie part Schip. Thank you, Shirley for trying them! She has a lot of agility, that’s for sure. Been making something almost exactly like this for years. It is amazingly tasty for being so simple. I have been known to substitute canned chipotle or jarred sliced jalapeños for the fresh in a pinch with good results. Wonderful, Debbi! Great minds. Thank you for your review! I’ve made this salsa several times now (I love the cookbook by the way!!! ), and it is SO good. It beats a store brought salsa hands down. And it tastes even better the next day (if there was any left). Thank you, thank you! I’m so happy to hear that. And yes, tastes even better the next day. Love this recipe! Will be making it again…only complaint was mine came out too runny. Will have to drain more from the fire roasted tomatoes, but that should do the trick!! Definitely a winner!! I’m sorry to hear that! But, I’m glad you still liked it. :) Yes, drain more liquid if you like it chunky. Looks yummy! Do you have a good substitute for cilantro? I don’t, sorry! You could always leave it out. I find adding parsley with a bit of lemon rind a good substitute for cilantro. My husband says cilantro tastes like soap, so this mixture works great instead!!! With your husband on this one – I am going to try it with lemon rind and parsley – Thank you for the idea! At firts, I found your blog just for my assignment. But now your recipe makes me interested in cooking! How is the taste different between cooking with roasted tomato and raw tomato? Welcome! The flavor will be very different. The roasted provides a deeper flavor. The way you explained each and every small thing is awesome. I am definitely going to make this and share my feedback with you. Thank you, Sue for sharing! Love this salsa—thank you! Been making it weekly for our fridge since I found this post. Great Salsa. I always add a pinch of nutmeg to mine – you can’t detect it but it adds that je ne sais quoi! Also I always use a smidge of white pepper for the same reason. Nutmeg, interesting! Thanks for sharing and for your review. Thank you for commenting! Happy to hear you have enjoyed several recipes. I’m glad you can still get your salsa fix with this recipe in Dublin! I appreciate the review. This salsa was made for summer get-togethers! Hmm. I love this salsa a lot It was so easy because I just need to buy jalapeño, I already had others. Though I did use the fresh diced tomatoes, the taste was amazing! Great snack for weekend! That’s awesome! Thanks for sharing. Yes, great snack for the weekend. I made this for the first time today (from the cookbook, which I LOVE). Is it appropriate to eat all of it in one sitting? I think so. So delicious! Thank you! Delicious!!!! I couldn’t stop eating it!! And so easy too. Music to my ears! It’s hard to stop with this one. Thanks for sharing. Hi, Kate! My gosh, you don’t know how helpful finding your recipe is! I’m having guests this weekend and thought about doing my own salsa instead of buying from the grocery store. I’m definitely digging your recipe and I’ll try whipping it up :) Thanks a lot for sharing! Hooray! Glad to hear that, Nicky. You’re welcome. Delicious!!! Tried it for the first time and even my husband was impressed….it was a crowd pleaser. Thank you so much for sharing your recipes. I will be trying the green salsa next. Also…I did take the advise of fire roasting the Jalapeño and it really enhanced the flavor…and definitely go with your preferred brand of tomatoes. It makes a big difference. Thank you Kate!!! Fantastic! It’s seriously the best and so easy to make. I’m glad to hear it was a crowd pleasure. Let me know what you think of the green salsa as well, Vero! I appreciate the review. I’ve been searching for a salsa recipe for an upcoming dinner party, and this one sounds delicious! I’m planning to make a batch exactly as written. For a second batch, I’d like some variation. What do you think about adding some fresh/frozen corn and black beans or black eyed peas? Sounds like a great way to change it up! Fantastic! 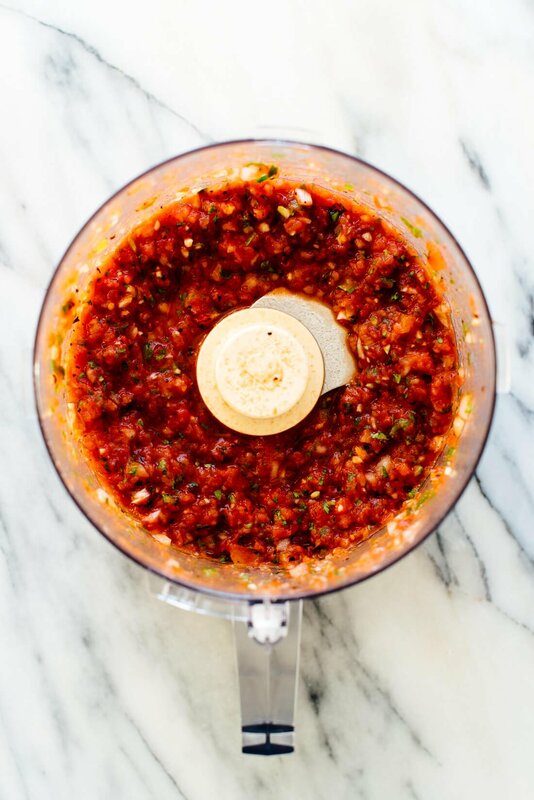 I would have never dreamed I could make my own salsa so quickly! I loved it as written but as I was tasting it my eyes fell on a can of hot Hatch Green Chiles. I added 1/4 cup just to see what would happen. What a great addition. Thank you so much Kate! Oh, spicy! Thanks for sharing, Lee. Kate, I just have to say it, you’re amazing! This salsa is hands down the BEST salsa I’ve ever had! My dad constantly asks me to make a double batch of it because it’s so good! I will admit that I do add another 1/4 cup of cilantro because my family loves it’s taste. You’re so sweet, Sam! I’m glad you agree it’s the best. This recipe was delicious!!! I made exactly as written and it is super mild for my taste. I will definitely make this again and again, but add more heat. A full jalapeno with seeds, maybe even a Serrano pepper instead of the jalapeno. Wow! That is a lot of heat. I’m glad you like it. Thanks for your star review. This salsa is amazing! We had it over simple grilled salmon and it was absolutely delicious! Three generations (from grandparent to teenager) loved it! My kids want this as their go-to salsa from now on. Thanks for a great recipe! Thanks for sharing, Lucy! I appreciate the review. Just gave it a try… Delicious! Love all your recipes; all healthy, flavorful and easy. I have seen a few salsa recipes on tv, but this looks great. hope it tastes even great. I’m gonna try this soon. My recipe for pico de gallo or salsa using hand cranked food processor. Put in unpeeled garlic and crank*. pick out garlic paper.. Put in onion quarters and crank*. put in jalapeño (wit or without seeds) and cilanto and crank*. Put in tomato quarters,salt and line juice then crank*. Since everything is rough chopped before going into the total time is about 5 minutes or less. I used to go to our local very good Mexican restaurant every Monday just to buy great salsa ( we poach eggs in it…yumm!!!). Then I tried this recipe………the restaurant owners thought we had moved as I hadn’t been in in 6 months because this is as good ( or maybe a bit better) than theirs! Also have added 1/2 c. cucumber to the final salsa and used in Coctel de Mariscos ( okay…not vegetarian) but, it was so fresh and bright! Thanks Kate. That’s so funny! When food drives some of your habits. Thanks for sharing, Ellen! 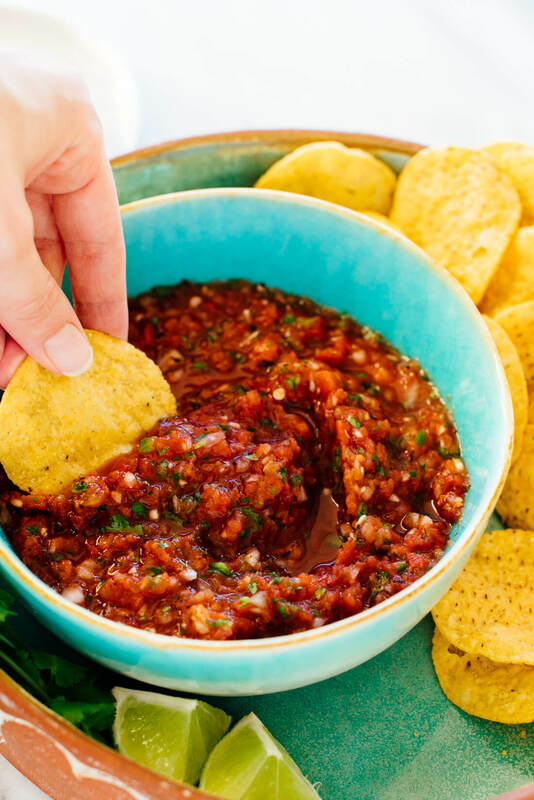 Perfect salsa for the week – So good! I’m glad you love it! Thanks for the review, Mary! OMG!! I’m seeking this recipe. I will try it tomorrow. Thanks for sharing a valuable recipe. Love the recipe! I added the tinned tomatoes and 1 ripe fresh tomato to the recipe. Also a dash of cumin powder and it was perfect! Thanks for sharing your approach, Janki! I’m glad you loved it. I’ve been looking for a skinny salsa for so long! All the other recipes use copious amounts of caloric olive oils. Kudos to you for helping ladies mainstain our girlish figures. :) I tried this and it’s AMAZING as a dip for carrot sticks. Much love! Thank you, Sara! I saw the one star and got nervous you didn’t like it. But, I’m glad that’s not the case! This is delicious. I never used canned tomatoes for salsa before, love the flavor. I’m glad you loved the flavor, Karen! Absolutely love everything I have made from your book and blog, almost as important so does my family. I have half my sons University football team here when I make the roasted cauliflower tacos. I’m not kidding. Tonight Im making the vegetarian tacos. Just me and the Mister tonight. Any suggestions for the left over cabbage that I will have? love this recipe! 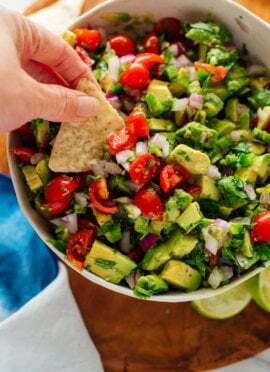 This salsa recipe is so amazing, I’m going to try this recipe right now. You’re welcome! I appreciate the review. Kate, I made your recipe as written, but used fresh Romano tomatoes that I parboiled to remove the skins. I also used 2 jalapenos cause I like a little more heat. I must say it was the BEST! That sounds delicious, Mike! Thank you for sharing your take on this recipe. I was certain I must have commented before, since I’ve made your salsa so many times; but I haven’t! In the past I made the recipe as written to be more versatile and please the most people. Since my husband and I like spicy salsa, today I made a double batch and kicked it up a notch using some of your suggestions. Iused the large can of the tomatoes, which is a few ounces less than if I used 2 regular cans but kept the rest of the ingredients doubled and used a larger jalapeno with a few membranes & about 1/4 of the seeds. I was too lazy to measure the lime juice and squeezed in the juice of one whole lime. After blending quickly, I stirred in another 1/4 c of cilantro . Absolutely delicious! I didn’t think it would be better than my other batches, but oh my! Going to make us wait until tomorrow for the flavors to really blend. Wish me luck. I’ve already dirtied 4 spoons going back to “taste test ” it! Thanks, Kate, I have loved every recipe I have tried and your cookbook is beautiful! Haha. Pam I dirty more spoons taste testing also. Love this recipe. I bought your book but due to putting in my Wildlife pond I haven’t had time to look at all of yet (just skimmed it so far, couldn’t wait). I will mix this salsa together for sure! Salsa and pico are my faves, haha, cuz they top my other faves, tacos, burritos, and tostadas. I’m excited you got my cookbook! I can’t wait to hear what you think of it. OMgosh, just made this from your book – NEVER going to buy salsa again! This is the bomb! Instead of Cilantro, I added Lemon zest or rind and parsley per Anna and it worked. Kate this recipe for salsa is outta this world great. I am a new vegetarian and am so grateful to have your great recipes to guide me. Now out to work on the Wildlife pond with the kitties and doggy. Hooray!! Thanks for sharing, Raine.